Forget the latest weight-loss fad - science may already have worked out what diet is best for you. Experts say a personalised approach could transform the way people lose weight. January is a month when many go on a post-Christmas purge and start dieting. It's also the month when many fail and go back to their bad eating habits. Scientists say this isn't just down to a lack of willpower. It is due to a person's individual make-up - their genes, hormones and psychology. The latest weight-loss theory is that instead of reaching for a one-size-fits-all diet, people should follow one that is tailored to their individual needs. For the first time leading obesity experts and BBC Science have put this theory to the test nationally. Over three months, 75 dieters were put through a series of tests and monitored at home. The study was overseen by scientists from Oxford and Cambridge and their research teams. What's the right type of diet for you? The study looked at three types of overeaters. Feasters who find it hard to stop eating once they start, constant cravers who feel hungry all of the time and emotional eaters who turn to food when they get stressed or anxious. When it comes to feasters, research shows hormones play a big part in their eating habits. In particular, they produce low levels of certain gut hormones that are released when food arrives in the intestines. These chemical signals travel through the blood to the brain and tell the body when it has had enough food and should stop eating. What's The Right Diet For You? A Horizon Special is broadcast on BBC Two on 12, 13 and 14 January at 21.00 GMT. "Some people have astonishingly low levels of certain gut hormones and are not getting those signals," says Susan Jebb, a professor of diet and population at Oxford University. Constant cravers always want to eat and their "hungry brains" often want fatty and sugary foods. Scientists know certain genes make people this hungry. They disrupt the way signals are sent to the brain telling it to stop eating, tricking it into thinking fat stores continually need replenishing. "The role genes play in losing weight is unequivocal, but due to changes in technology we are beginning to find out what these genes are," says geneticist Dr Giles Yeo, from Cambridge University. Emotional eaters reach for food when they are stressed or anxious. When the brain perceives a person is in difficulty, it triggers changes to the body, like the heart rate increasing. This stressed state makes it even harder for people to overcome what they are facing. This sort of eater has developed habits that are hard to break and in stressful times their brains seek out a reward. "People often think diets are about willpower," says Jebb. "Forget that, diets are about habits. There has never been a study that says people can will themselves to lose weight, but they can change their habits." So, what diet should each group follow to successfully lose weight? Feasters need a diet that makes them feel full for as long as possible. Scientists suggested a high protein, low glycaemia index (GI) diet. These are foods that boost gut hormone signals and include fish, chicken, basmati rice, lentils, grains and cereals. No potatoes or bread because they don't make people feel full for very long. "Protein and carbs that are not absorbed quickly are absorbed lower down the gut, producing more hormones that make us feel fuller," says gut hormone specialist Prof Fiona Gribble, from Cambridge University. Constant cravers have genes that make them feel hungry most of the time. As a result they struggle to diet for seven days a week. Instead they were told to drastically reduce their diet to 800 calories on two days of the week. They ate normally, but healthily, for the other five. This is often called intermittent fasting. "Constant cravers have the toughest job as they have a strong predisposition to being overweight," says Jebb. "The fasting diet should shock their bodies into burning fat." "My relationship with food has been quite negative in the past. I now know that is a result of being deliberately deprived of food when I was very small. I would often only be given bread soaked in water. It has taken a long time to realise the effect this has had on the way I eat. The study made me realise food was controlling me, now it is the other way round. "Getting support was an essential part of that, weekly meetings were a big help for me. I feel relieved at being classified as an emotional eater because it gives you a footing from which to continue, unless you can see what the issue is you've really got no hope of changing. "I lost 1st 11lb (11.3kg) over the 12 weeks and my total weight loss now is 3st 1lb (19.5kg). As my size goes down, my confidence and belief in myself goes up." Emotional eaters have established bad habits that are hard to break. As well as following a healthier diet, group support was important for them. Encouragement can trigger the motivational part of the brain that helps people overcome stress. By being part of online support groups and attending weight-loss meetings, they were encouraged to stick to their diets. They also had cognitive behavioural therapy to help manage the thoughts and behaviour associated with emotional eating. Should we worry about how much protein we eat? 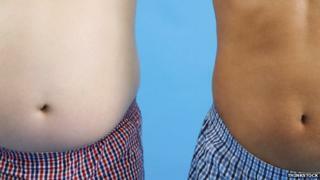 The study also confirmed other behaviour that could help people in all groups to lose weight. The study also put to the test popular beliefs about the effect of exercise and people's metabolic rate when it comes to dieting, busting one dieting myth. It found exercise can help people lose weight, but there is a catch. Often they are less active afterwards, negating much of the hard work they have done. The most effective way to lose weight is nearly always to change your diet, say the scientists. But one of the great myths of dieting is the role of the metabolic rate, says Jebb. This is the speed you break down food and change it into energy. It can be affected by many factors, such as age, gender and size. Often overweight people think they can't lose the pounds because they have a slow metabolism and slim people have a fast one. "What we know is bigger people actually have a higher metabolic rate; that's because they have bigger heart and lungs," says Jebb. "It takes more calories to keep their bodies ticking over. It's rather like a big car that uses more fuel." The metabolic rate goes down the more weight you lose, she adds. One test conducted as part of the study showed on average the metabolic rate of all dieters went down by 5% as they got slimmer. This "biological backlash" makes it harder for everyone to lose weight over time. It's why a dieter's weight often plateaus. The three groups were challenged to lose 5% of their body mass - in fact, they lost 8%. It was a collective loss of 103 stones (654kg). Constant cravers had the toughest job and feasters lost the most. Importantly, dieters expressed huge relief at finding out why it was so hard to lose weight. "They finally understood why their biology was working against them and that is very empowering," says Yeo. It is still early days for the science of personalised diets but there is huge potential is for this approach, say the experts.